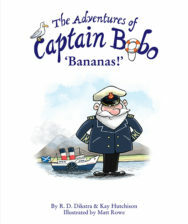 Author RD Dikstra talks to Books from Scotland about the inspiration behind his new children’s River Clyde-set picture book The Adventures of Captain Bobo: Bananas! Your last book Tigeropolis was all about vegetarian tigers, so what’s the link to paddle steamers and the West Coast? Actually my first involvement with publishing wasn’t Tigeropolis, but was in helping one of CalMac’s best known Masters, Captain Robin Hutchison, tell his life story in Hurricane Hutch’s Top 10 Ships of the Clyde. The book was as much a social history of the Clyde (from the War up to the late 90s), as it was a book about ships such as the Queen Mary, or the Waverley. In researching the book we heard many comical stories of life on board, but unfortunately we just couldn’t fit them all in. Nonetheless we knew theses stories needed to be told, and we also wanted to do that in a way that would appeal to children. The Clyde, and the sea-faring heritage of all the people who sailed those waters, are just too important to be forgotten. So, I think you can say the idea for Captain Bobo was born not long after Hurricane Hutch was first published back in 2014, it’s just taken us a while to finally get there. What is the story of The Adventures of Captain Bobo? The series is intended for children aged 4 plus, but hopefully will appeal to a far wider audience. 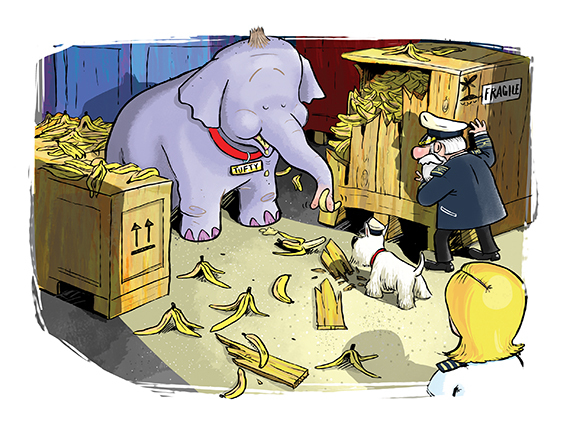 In ‘Bananas’ we introduce the reader to Captain Bobo and his crew and of course to his wonderful old paddle steamer Red Gauntlet. All the stories are based loosely on real life events from the days before car ferries. This book is inspired by one story we heard about how animals used to be transported to and from the islands. In the story the new Island Safari Park’s star attraction misses the ferry and gets left behind. It’s left to Captain Bobo to try to save the day. I don’t think I’m giving too much away to say that with a little ingenuity, and some great teamwork from Red Gauntlet’s crew, it all ends surprisingly well. So tell us a bit about the main characters. Captain Bobo is the very experienced captain who is always willing to go that extra mile to help people. His ship, Red Gauntlet, is an old paddle steamer – it’s due to be replaced by more modern vessels, but as the stories will show it’s always able to help save the day. Sheila is First Mate – very much younger than Captain Bobo, but very able – she really knows her stuff and is always able to deal with a crisis. Puffy Watt – is Chief Engineer – there is nothing he does not know about the workings of Red Gauntlet. Then there’s Boing Boing the Assistant Engineer, Bleep the Bo’sun, Billy the Cabin Boy and Zoe the island’s Pier Master. This particular book also features Tufty, a wonderful, and banana loving, elephant. I wouldn’t be surprised if he makes a reappearance later in the series. Last, but not least, is Salty – Captain Bobo’s faithful dog – a Scots Terrier. Animals seem to feature a great deal in your books. Why is that? I’ve always been interested in wildlife and conservation – my Tigeropolis books are based on my travels in India and long time involvement in issues around tiger conservation. The tigers in Tigeropolis were inspired by my first ever encounter with a tiger – that tiger (a tigeress called Vijaya) seemed totally in control of events. The books are principally fun, but they do have an underlying message about conservation, and have been well received by a number of India’s foremost conservationists. Is there any particular message in this new picture book? Bananas! is principally just a good story, but I hope it helps foster some appreciation of wildlife (there’s even a dolphin making an all too rare appearance on the Clyde at one point). That and the value of teamwork. 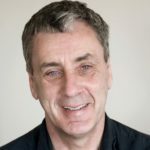 So what’s your connection with the Clyde? I was born in Glasgow, so had many trips down the Clyde in my childhood. I can still remember sailing down from the heart of Glasgow on the Jeannie Deans aged about 6 or 7, with all the sparks and flares, clanks and bangs coming from the shipyards, either side of the river, working away as we sailed by. For 10 years I also had a house right on the water at Skelmorlie, so I well remember making breakfast about 7 am with “Ding, Dong” … and … “Welcome Aboard Cal Mac,” blaring out of a tannoy from outside on the river as a car ferry slipped past on its first run of the day. Who created the illustrations for the book and can you tell us how you worked with your illustrator? We’ve been working with Matt Rowe since Tigeropolis when we fell in love with his characters. Children respond immediately to the characters – they are cute and full of expression, which helps bring life to the stories. We work well together – I set out roughly what might work and where, and Matt comes back with some pencil sketches which we then develop as needed. Strangely we have never met in person. Matt likes to work from home and, although we have regular calls and emails, we have yet to meet face to face. The Adventures of Captain Bobo: Bananas! by RD Dikstra & Kay Hutchison with illustrations by Matt Rowes out now published by Belle Media priced £7.99. The Adventures of Captain Bobo: Bananas!